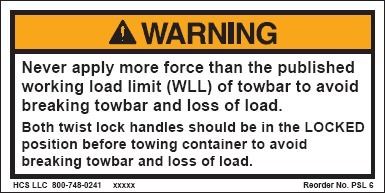 Towbar for towing ISO Containers with a towing vehicle whose connection point is lower than standard models. Newly designed twist locking ends quickly secure to the bottom end apertures of ISO 1161 corner fittings and can tow fully loaded 40' containers weighing up to 67,200 lbs. The AB42000A-6PA is a variation of our 1PA and 2PA versions in that (1) the legs are longer and (2) the connection point/ring is bent, which allows for a low connection point on the tow vehicle.